Let me introduce one of the longest-selling picture books in Japan – Ookina Ookina Oimo (The Big, Big, Sweet Potato) by Suekichi Akaba. 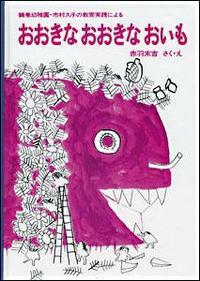 It was first published in 1972, and the story was based on the educational practice by Hisako Ichimura. 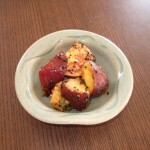 Many kindergartens organize “sweet potato picking” as a school outing in autumn. They start drawing a big, big sweet potato all together. They put many pieces of paper together, and keep on drawing a big, big sweet potato. -How do you pick up such a big, big potato? -How do you wash such a big, big potato? -What do you do with such a big, big potato afterward? -Let’s have a big potato party!! At the end, they hear popping sounds… and they start flying one by one!! The book shows the greatness of children’s imagination! And the simple line and the color of the picture have a strong impact on us. I myself enjoyed this book when I was a kid. Now, I read this to my kids. They love it as well. My son and I made “daigaku-imo” (Japanese candied sweet potatoes), which is one of the potato recipes the kids in the story cook at a big potato party! We put black sesame on top of it. 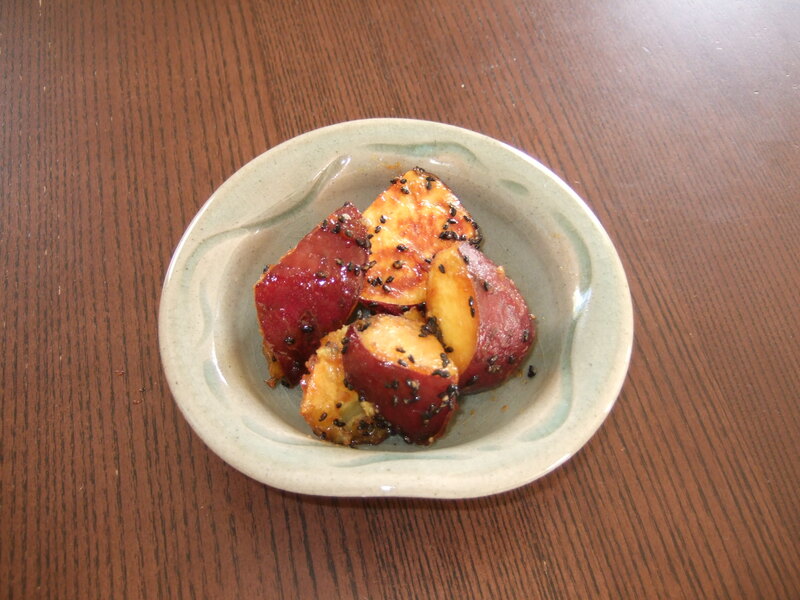 daigaku is the Japanese for “university”, and imo for “sweet potato”. The name daigaku-imo comes from the fact that it was popular among Tokyo University students during the Taisho (1912-1926) and Showa (1926-1989) period.